Austin Phelps (1820 -1890) was an American clergyman who successfully communicated complex Christian theological concepts to a large readership. Phelps was born in West Brookfield, Mass, a descendant of old Massachusetts English settler stock. In Philadelphia, he attended the University of Pennsylvania, graduating in 1837, at the mere age of 17. He studied at Union Theological Seminary and the Yale Divinity School, but interestingly, although he did not complete his theological course, he was allowed to preach at the Third Presbytery of Philadelphia. In 1842, he was ordained as pastor of the Pine Street Congregational Church, Boston. After six years as pastor, he took on a position he would hold for the next 30 years, that of professor of sacred rhetoric and homiletics at Andover Seminary. Phelps was elected its president in 1869. He retired due to poor health, and the remainder of his life was spent in semi-invalidism, although he was able to do much writing on religious subjects. He published a number of books about the difficult and varied tasks of a minister: The Theory of Preaching: Lectures on Homiletics (1881); Men and Books; or Studies in Homiletics (1882); My Study and Other Essays (1886); Rhetoric: Its Theory and Practice (1895). 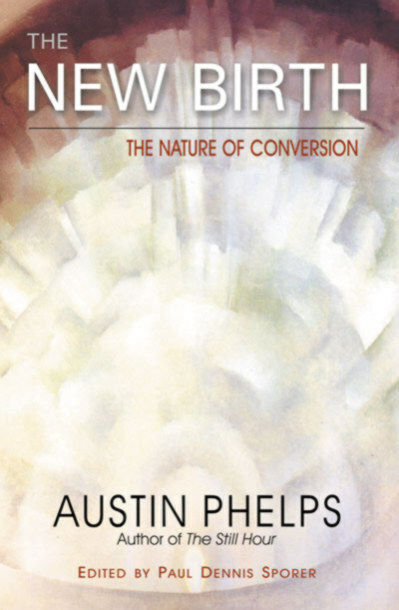 However, Phelps' book The New Birth addressed some of the most difficult religious principles, and is an important contribution to the literature of "popular" theology.